Home> Resource> Phone/Data Clean> How to Solve Common iPhone Storage Issues? Always feel that there is not enough storage space on your iPhone 7/7 Plus/6s/6s Plus/5s/SE when you have bought it for some time? Especially when you want to capture pictures, shoot videos, update the games you like, download new apps and so on, you could easily get annoyed for the limited storage on your iOS device. You might think it marvelous because you only store some videos, songs, images and apps on your iDevice, how can you run out of your iPhone storage space? Well, actually that's a common storage problem on iPhone and you could find out the way to solve the iPhone storage issues in this article. * Regularly backup and then delete photos on iPhone. No matter you have 32GB, 64GB or 128GB storage on your iPhone, the storage space would be absolutely getting smaller and smaller when you take more and more pictures and save them on your iPhone. And usually every HD photo can take up at least 5MB of the memory, and if there are hundreds of photos on your iPhone, it can eat up large amount of space on your iPhone. So the best way is to backup and transfer the images from your iDevice to another secure storage location and then delete all the pictures on your iPhone except a few important photos that you want to save on your iPhone. And you could absolutely view the photos that you have backed up on other device or import them to your iPhone again. Also Read: How to Transfer iPhone Photos/Videos to External Hard Drive? * Delete downloaded & watched videos and backup the important ones. The video is a leading killer for iPhone storage. The downloading videos, like movies, video podcasts, TV shows, music videos, the life videos you shoot with your iPhone and so on, can easily eat up lots of space on your iPhone, especially the high definition (HD) ones. So the best way to deal with the videos is to delete the downloaded watched videos, or just watch videos directly online without downloading. Besides, before you delete the videos, please backup the important ones and export them from your iPhone, such as the life videos you shoot to record your life. Also Read: How to Transfer Videos from iPhone to iTunes? There must be some apps that you don't use at all, or you only use them once or twice for a long time. Some games with 3D and HDR effects could easily eat up 1GB of space, you can totally delete them if you have completed the game. And some apps have the same functions, like map, camera, music player, video player and so on, you could also keep the one you like the most and delete the rest. And of course, you could also transfer the apps to iTunes for backup and reinstall the app from iTunes when you need. Also Read: How to Transfer Apps from iPhone to iTunes or from iTunes to iPhone? * Pay attention to the "Others" - the uncategorized data. The file saved in the "Others" also takes up a large amount of storage space on iPhone. Actually, the "Others" is the hidden data containing the files of local caches from apps, browser, games, mails, messages, notes and so on. You might find it difficult to discover and delete them on your own. But you still can find out how to delete "Others" data as below. Also Read: How to Delete "Others" on iPhone with 1 Click? 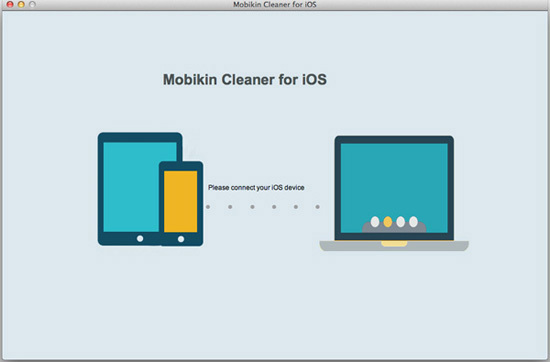 Actually, with the help of the iPhone Storage Optimizer - MobiKin Cleaner for iOS, it would be a piece of cake to solve the low storage issue on iPhone. The iPhone Storage Optimizer eliminate all types of junk files with 100% security on iPhone/iPad/iPod touch, then you might clean up storage space on your iPhone and boost up your iOS device's running speed with ease. This powerful program supports to remove selectively the data without any opportunity of information leakage, including the privacy data like contacts, notes, calendars, text messages, safari cookies, calling history, email caches, etc. by deeply scanning every corner of your iOS device. And also the junk files can be deleted easily with the software, for example, app caches, app cookies, app temp files, app crash logs, downloaded temp files, photo caches, user storage files, iTunes radio history and etc. In a word, this powerful program can help you to solve all kinds of common storage issues on iOS device with 1-click and it helps you to make iDevice run fast. Secondly, connect your iPhone to the computer with a USB cord. Then the program will detect your iPhone automatically, and you might see the interface with different modes. 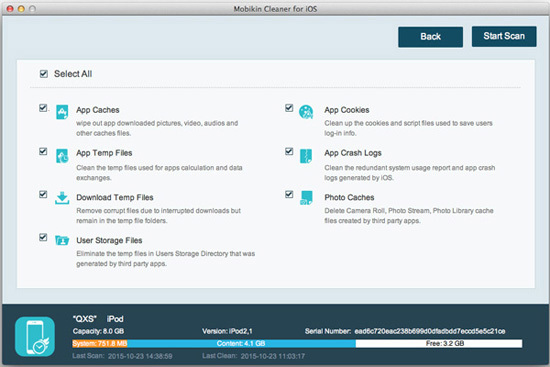 Just select the "Quick Clean" mode by clicking the icon and you might see different types of junk files showing in different folders, including the App Caches, App Temp Files and etc. Thirdly, you can select some of the files that you want to clean, or you can also choose to clean all junk files by click "Select All". After selecting, just hit "Start Scan" to show the selected files with details. Then mark the ones that you want to remove and hit "Clean" button to delete all the selected files. Thus you have cleaned all the junk files to free up storage space on your iPhone and it will run as fast as a new one. 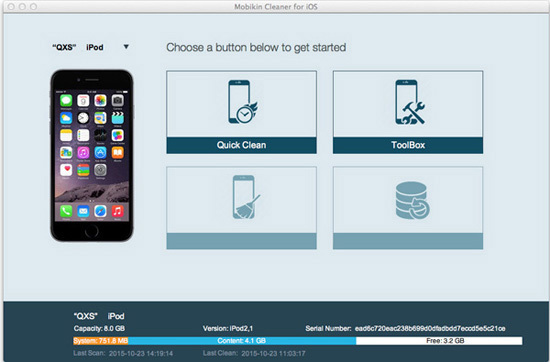 Just regularly clean up your iPhone with the program to make it enough storage space. How to Clear User Storage from iPhone? Want to Free up Storage of Documents & Data on iPhone6 Plus/6/5S/5/4S/4?